So durable I inherited one. Folded up and in hand for scale. My dad passed this stove down to me after many years of service. It looks like it is around 20 years old? Would that be an exaggeration? The yellowed instructions put the company at an old address with only a local Seattle phone number. The bottles were just plain aluminum with no logo or name and the pump was just yellowish plastic. It worked like this for many years for me before the hosing became brittle and cracked and the other rubber and leather parts deteriorated. I had to buy a new pump, which still works great minus the cheaper flame adjustment handle running into the clamp that holds the hose into the bottle. Come to think of it, the old pump even had metal parts. Durable and long lasting to the point where it was passed to the next generation. Nothing seems like it is about to give out any time soon. Replacement parts like the pump were reasonably priced. The fact that there continue to be replacement parts for such an old long running line of stoves is is amazing and should speak volumes about the company and this piece of gear especially in a manufacturing world that changes minor things almost every year to keep people form fixing things and buying newer less durable items. Very stable stove (low and wide and sturdy tripod) and I find its weight and size to be just fine for even a cross-country, fully loaded bicycling trip. It can hold as big of a pot as you want to put on top of this thing. I have put 5L kitchen pots on this and made massive amounts of spaghetti sauce for many people on car camping trips. It was almost like I was at home in the kitchen. Super easy to clean and the tools to do it are light and unnoticeable to carry with you. The wind guards are light and unobtrusive to take with you. They are also very helpful and in some cases pretty much essential to have along. They help you boil faster and become more efficient with your fuel which I feel like the stove is pretty efficient to begin with. Perhaps it's the old age of my model, but it takes a little longer to heat up and obtain a blue flame. It can flame up at times when I haven't used it in a while. This may also be somewhat user error and me hardly ever taking the time to clean it. Regardless of that it does not just click on like a brand new Jetboil style product. It also takes a bit longer to boil things and sometimes a lot longer than something like a Jetboil. Despite this, it still seems to be pretty efficient with the fuel. This will last forever as a Jetboil or similar product does not seem like it will. To be honest, this is the first and last stove you will probably need to buy. Are you a "just add water to the Lipton noodle packet and toss in a soft pouch of chicken type" or do you like to be a bit of a chef in the woods? If you are a noodle packet person and are just concerned with boiling water then no doubt about it, get the Jetboil type stove! If you ever want to do anything more than that and only pack one stove for a greater number of mouths then get the Whisperlite. The Jetboils of the world sure are cool though and easier to light as long as they are in new working order! However, most of us just don't need them and are not in that big of a hurry. When do people use this? I have never come close to needing it. I suppose if you are in another country cycling across it you might come across this being very handy. When I bicycled across the U.S. my friend brought the Whisperlite that could use several types of fuel. He was pumped about it until he was bummed that we never even came close to thinking about using is additional functionality. Near the end we tried it once on purpose just to see how it performed. It was super smokey and sooty and needed a heavy cleaning before another use. It did work more or less though. My opinion being that from what I can see cycling across a country or walking across one are the only reasons I can see to need one. If you are in the U.S. you probably won't ever need it. Even if you do run out of fuel in some remote part of a country chances are you have the skill to start a small cooking fire for meals until you are able to get more standard fuel for your stove. Am I wrong on this? Not totally sure about this, but I have definitely used it down into the teens. It can take a little longer to boil things. I would recommend this item of gear for anything other than car camping. If you are car camping just get one of those green suitcase stoves or a modern equivalent and you will be quite happy. Nice review, Albert. Got any pictures of your stove to share? Thanks for the pictures, Albert! Simply the THE BEST compact camp stove I've ever used! Simply the THE BEST compact camp stove I've ever used! I've had mine for 20+ years and still have not found anything better for canoe trips and winter camping. As long as you can light it you have dinner, a warm/hot beverage, or in a survival situation you will stay warm and alive! I first came across this camp stove back in 1988 while on a 21-day trip in the Boundary Waters Canoe Area Wilderness in northern Minnesota while I was still in high school. Our guides used this stove and for the entire trip it performed flawlessly, even in the worst of weather. After high school I was a guide myself. The outfitter I worked for supplied a handful of high tech, some more expensive, and some otherwise excellent stoves, but none of them worked as well as the MSR WhisperLite. That summer I ended up buying and using my own WhisperLite, an investment that’s been well worth it. I haven’t guided since college but I’m still a high adventure enthusiast, and a gear nut. I continue to look at new camp gadgets and gear but this stove remains a favorite. What makes this stove so good? The stove sets up in two minutes or less. Mine came in a bag big enough to hold the stove, one fuel bottle, the pump, and a heat/wind shield. Everything stays together in the bag until needed. Simply uncap the fuel bottle, screw on the pump, connect the supply line from the stove to the pump, and give it a few strokes and light. The fuel needs to heat up a minute or two to vaporize inside the tube, and soon you have blue flame jetting out the ports of the burner. The flame is adjusted at the fuel bottle, not at the burner, so there’s no need to remove your pot just to adjust the heat. I’ve been able to boil a full pot of water in less than four minutes with mine (with the heat/wind shield in place). The heat/wind shield is made of a heavy duty foil that folds up nice and small but they do wear out, I’ve replaced mine twice in the last 20 years but they’re pretty inexpensive, I just chalk that up to maintenance cost. MSR does make a repair and maintenance kit but the one that came with my stove has hardly been used, I’m surprised I haven’t lost it by now. The single 20 oz fuel bottle that came with the stove is usually enough to last me a full 7 days in the wilderness, but on canoe trips I usually bring a spare bottle just, when backpacking I just take the single 20 oz. bottle to conserve weight and have never had a problem. When backpacking I pack the fuel bottle separately, inside the stove bag, and put the stove itself inside the cooking pots. The stove is easily cleaned and is very easy to maintain. Just a little soap and water on a rag and wipe clean, that’s it. This stove is tough as well. It’s been dropped, knocked over, kicked, sat on, had things dropped on it, and generally banged around pretty good, but the stove still works and functions as good as the day I bought it. The fuel bottle has pretty thick walls and even though a couple of my fuel bottle have dents from accidental dropping, or other careless handling the bottles are all intact and have not punctured or cracked at all. The plastic caps have all stayed intact without even a slightest crack despite all the abuse. I spent the last two weeks camping in Great Smoky Mtns. N.P., my twenty-five year old WhisperLite fed me every day. As others here have noted, it's simple, reliable and the thing lasts. I've used it in all seasons, put it away for years, it always performs. I'll buy it some new gaskets, but other than that, I have more than gotten my $60 back through the years of use. It's an excellent stove. My Whisperlight was the early 1980's model that had a red cloth-like cover on the fuel flex-piping. It finally died when the flex hose to hard pipe joint broke.I called MSR for the repair part. They told me to not worry about repairing it, just send in $20 with the Stove, or $40 with the stove and pump to get a BRAND NEW Whisperlight! That is great ! In a world where the opposite has become S.O.P., it's heartening to find a company like MSR supporting their customers as if they really cared about them. Exactly! Just $40 to replace a 20-25 year old stove, with a NEW stove that would cost around $80 in the store. Will I buy more MSR products? You betcha! Before reviewing this we need to address the elephant in the room, something I refer to as gear Stockholm Syndrome. We tend to have overly fond feelings about equipment when it is used to bail us out of uncomfortable situations. For example, you are caught in a driving rain, you retreat to your tent and are warm and dry. Because the tent kept you from a cold and wet night your opinion of that particular tent is higher than it would be if you never got caught in the rain. I bring this up because I've used the Whisperlite for a few years without thinking much about it one way or another. Last March I took a group of brand new Boy Scouts camping. The weather is typically in the mid 40°F during the day. This weekend the polar vortex paid a visit and temps were in the low teens. The scouts had brought propane camp stoves with 1 pound bottles. Sunday morning the scout's eggs were semi frozen and the propane stoves put out very weak flames. I didn't want to head home cold with our tails between our legs. I had the Whisperlite and a large fuel bottle in my pack. It looked sort of comical, a tiny backpacking stove with a 5l pot of water on top. We boiled enough water for hot cocoa and instant oatmeal for everyone (15 campers). We boiled a second pot of water for dishes. Since that campout I find myself taking that stove even when an isobutane stove would be lighter and easier. This is why I question the objectiveness of my own opinion. If you are going on a backcountry trip with more than four people or during the cold of winter a liquid fuel stove has advantages over small isobutane gas stoves. This stove is field serviceable, and dependable. I do a service every winter which involves going through the motions of cleaning the fuel line and checking the o-rings and inspecting the pump cup, all replaceable. Not your typical review, but hopefully illustrative of the stove's capacities. Thanks for the review, Tÿcho! I think you've quite objectively decided this stove's dependable performance makes it worth carrying. Have used this stove for 25+ years. It never fails and all the parts come apart if you need to fix it in the back country. I've pulled mine out of the attic after 4 years and it works first time on the trail. You ALWAYS knows how much fuel you have in your bottle, unlike the pressurized cans. At high altitudes above 8-9000 ft, I never trust anything else. It's tough, hard to break and easy serviceable, if you drop your bag off a cliff and your Whisperlite gets bashed! Wind, rain, snow, nothing stops it! The BEST stove I have ever owned! Very efficient at high altitudes and quick to boil 1 litre of water around 1-2 minutes (depending on the air temperature). It's very simple to set up, just unfold the legs and insert the fuel line. All you need to do is pressurize the bottle with the pump and let a little fuel leak into the holding cup then ignite. Flame control is nonexistent really — it's either full or off. I have found however that if you release the pressure in the bottle you can somewhat control the flame, but it is very minimal. You can only use this stove for rapid heating really. If you're frying something you need to be constantly there to stir it so the food doesn't burn. At room temperature I can boil 1 litre of water in around 2 minutes. This will vary depending on the outside temperature and if you're using the insulation guard or not. It's stable enough to boil water unsupervised or fry some food in a pan. I have found that the stove packs down quite small even with the windguard, which obviously makes it easy to fit into a small pack. 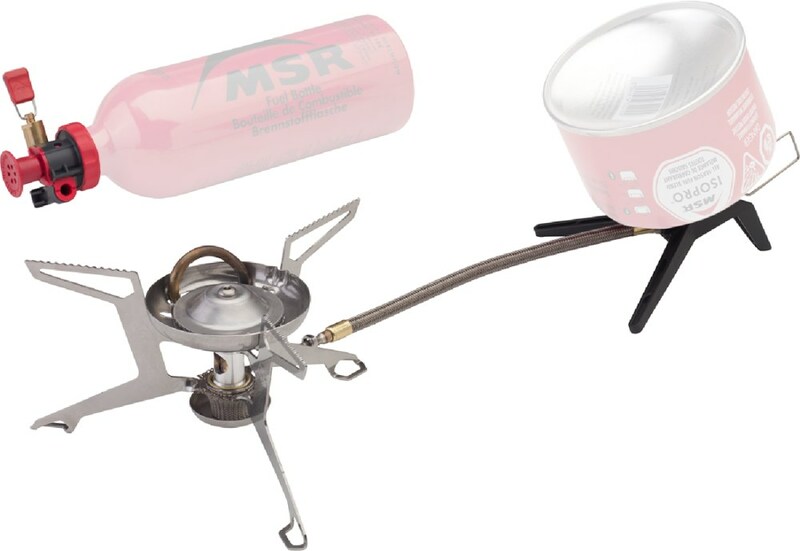 Whenever some newbie asks for advice for a beginner's gasoline backpacking stove, I always recommend the MSR WisperLite. I think the various reviews in this section quite adequately lists the pros and cons of this stove, so I guess a repeat of all these attributes isn't really really needed. I'd like to just add some of my personal impressions. I have been familiar with this stove for several decades. While the stove proved relatively reliable, I really hated the long delay between turning the valve and the resulting flame. However, through pure stubborn patience and practice, I managed to master this mysterious function. 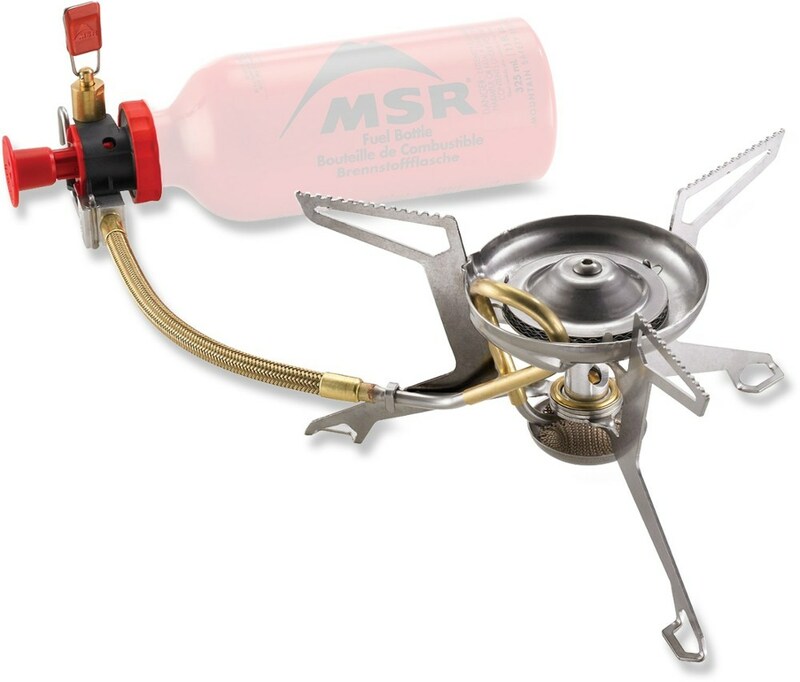 Now, whenever some newbie asks me for advice for a beginner's gasoline backpacking stove, I always recommend the MSR WisperLite. I feel for most people that this stove is economical and would work for most trips. Another benefit to a new stove user is the burner operates similar to using a normal kitchen gas stove, with the flame keeping a wide profile rather than the blowtorch common in many stoves. While maybe not the best type of flame for melting a lot of snow, it does allow for better cooking without burning. Unfortunately, my personal experiences with many of my friends' MSR stoves have been issues of clogging. I'm not sure this is a fault of the stoves (I actually think they were using automotive gasoline rather than white gas). 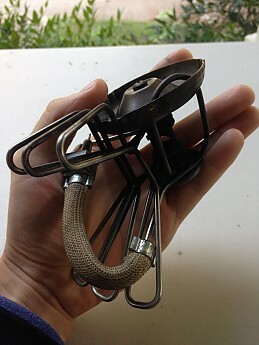 However, the WhisperLite is, in my opinion, the easiest stove to clean in the field as the most common fouling seem to be the filter in the burner assembly (pull off the spirit cup, remove and clean the filter, and replace). This is another reason I recommend this stove to neophytes. I mentioned that this is a relatively reliable stove with this coming to light in how I finally got my own WhisperLite. I saw the burner assembly at a yard sale where it was being offered for 25 cents! The woman running the sale mentioned that her brother (a SEAL in Desert Storm) had accidentally run over it with a Hummer. It looked in very good condition, so of course I jumped on it (no one else at the sale seemed to know what this was), and asked where the pump was. She simply asked what I didn't understand about a Hummer running over it. I ordered a new pump from MSR (cost $24), and I now have a perfectly operating stove. So, in summary, while I often use other stoves (primarily Optimus) myself, I still highly recommend this stove as a first (and often only) stove to my friends and acquaintances as possibly the best all around stove. Survived being driven over by a Hummer? Nice find. Update: A lot of us have been using the Whisperlite or Firefly for years. We all know that we need to check the pump cup before we head out on a trip, and possibly lubricate it or replace it. I recently ignored my own advice, and on a camping trip, found myself with no pressure. I tried (and failed) to get to the pump cup. It seems that a few years ago, MSR changed the design of their pump. There-to-fore, I had been able to easily access the pump cup and plunger. Not this time: I lined the plunger up with the mark on the pump body and twisted in the proper direction. Nothing. I twisted harder. Nothing. In a fit of rage, I twisted as hard as I could and ripped the cheesy, plastic pump body in half. So ends my years with MSR. Although they offered to send me a free, replacement, defective pump in the mail, I can simply not afford this kind of equipment failure. If you plan on camping in cold weather, or if you anticipate extended periods in the field, then you probably need this stove. I have never used the MSR Firefly, so I can't compare that one, but the Whisperlite will get you fed and clean in the coldest of conditions. MSR customer service is awesome. After ten years, I sent them my old pump from my Whisperlite, which had developed a crack near the pump ring, and they sent me a new one. The stove body collapses and fits into a 1 qt. cook pot. An 11 oz. bottle of fuel should last you 2.5-3 months. This is the equivalent of about 10 butane canisters. Some things to watch out for: The aluminum windscreen is dangerous. You could cut yourself (even fatally) if you grab for something in your pack and this is in there. Same with the bottom reflector, but it is smaller. The stove is not particularly stable unless it is on firm, flat ground, and you are not supposed to use pans/pots with a diameter of more than 9", because the cookware will not be supported adequately by the rather small legs. Get this stove away from your tent before you prime it, because the flame could reach a foot or two (I never cook in my vestibule, to be safe). As with any liquid fuel stove, it puts out a lot of fumes, so don't even think about using this inside a tent. If you need a shot of warmth, use a butane stove, instead. If you're looking for something durable, reliable and easy to use, don't mess around with anything else. I've had mine for almost 20 years. If you clean it every 10 or so trips, it will last forever. Sometimes pumping the fuel bottle is a drag. When I buy products for experiencing the outdoors, I look for products that are mechanically simple and reliable. If I'm fiddling less with my gear, I'm enjoying everything else more. And the simpler the design, the less that will go wrong. The WhisperLite is one of those products that has everything you need and absolutely nothing you don't... Same with most MSR products. They're not gimmicky—they just work. This stove will boil water faster than your range at home, and makes a sturdy base for cooking with all kinds of pots and pans. Some other stoves I've tried focus on being excessively small and compact, offering a ridiculously small and unstable base for cooking or boiling a pot of water. Other stoves put the fuel tank directly under the cooking surface... This is fine if you're boiling a cup or a very small pot, but if you're heating a decent size pot of water or want to use a fry pan for actual cooking, I've found it better to have a freestanding stove like this one w/the fuel bottle off to the side. It's much more stable. The WhisperLite's stainless steel construction is solid and incredibly durable. I also like the fact that I can buy all sizes of MSR fuel tanks, for shorter or longer trips. If you're new to backpacking and aren't necessarily sure what stove will be best (because there ARE so many choices), I recommend investing in something simple, stable, versatile and super-reliable. The only stove that delivers on that tall order MSR WhisperLite... It will meet all of your backcountry cooking needs for years to come. A very good stove that will heat up food and water fast. If you don't have the fuel line set just so or on a level spot it will tend to tip over. On the plus side, just set in place, then prime the fuel and you will have no problem. Lighting and adjusting the flame is easy and it cooks very fast. A well designed but now dated stove that uses toxic fuel and is filthy to maintain. I've owned a Whisperlite now for 30 years and figured it deserved a review. I worked as an Outward Bound instructor and a backcountry ranger with the National Park Service for 15 years, typically logging about 200 nights a year "under the stars". For the last eight years I've been the field equipment manager at a small college that emphasizes field work and experiential learning (lots of stove use). We've been using Whisperlites here for 25 years. I maintain about 200 Whipserlites (as well as many isobutane and alcohol stove systems) that see consistent, hard use by students and staff. So there: I've tooted my horn a bit. The point is, I've lived with Whisperlites for a while. The Whisperlite design has been around the block. It has a reputation, both with individuals and with institutions, as the standard for general purpose use. It is nicely engineered, and has received continued attention by the clever people at MSR. Generally, the evolutionary changes have helped the stove (though some would argue otherwise). It continues to set the standard for lightweight, packable, serviceable stoves. That's odd, because frankly it suffers from a variety of maladies. Some are unique to this design, others are shared within the class of whitegas (naphtha) stoves. The pumps are fairly complex and delicate. I continue to get back stoves whose pumps have broken during normal use. Despite careful servicing (during which we change out the O-rings and check, clean and lubricate the valve and plunger mechanism) Whisperlites routinely fail shortly after leaving our facility. The wire frame is easily bent and difficult and fussy to repair. The generator tubes clog regularly and even with good care have a limited life. Compared to almost any isobutane stove, the Whisperlite is clumsy, cumbersome and a pain in the neck to live with for extended periods (say 2 weeks or more...). White gas is an inherently volatile, messy fuel. 20 years ago it was about the only game in town. But not today. I can't think of any reason to carry around this toxic liquid when there are now such viable, easy to use and arguably "greener" fuels and fuels delivery systems out there. The new wave of Isobutane stoves are more efficient and more easily controlled than most high-end white gas stoves. The MSR Windpro is an excellent example. Hardly any moving parts, excellent serviceability, great harsh conditions performance. Alcohol stove systems, both commercial and homemade, are finally receiving the attention they deserve. Unlike white gas and isobutane, alcohol is cleaner to produce and can be manufactured using sustainable technologies. If you don't need to boil water in less than a minute then consider an alcohol stove. (What's the deal with "boil time" comparisons anyway? 99% of my cook time is spent in beautiful places, under spectacular conditions. What difference does it make if it takes me 5 minutes to boil a couple cups of water?). The Trangia is an example of a top of the line alcohol stove system. I'll own up to the fact that the kind of use we impose on these stoves is outside of the normal parameters that most "weekend warriors" operate within. What we put these stoves through can be pretty grim: novice users who don't read or remember instructions, big pots of food, stoves dropped in sand, dust and streams then shoved into poorly packed backpacks. Every stove designer's nightmare. It's a lot to ask of any stove. But we do the same to our isobutane and alcohol stoves. And in the end, the Whisperlite fails to match up. I still have the Whisperlite I purchased 29 years ago. But it's on my shelf, next to a Svea 123, an Optimus Hiker and my venerable MSR XGK. Whenever I gaze fondly upon it I remember good times, with good friends in amazing places. But when I venture out now, I do so with an alcohol stove system tucked in my pack. The Trangia is what I use now on almost every expedition and road trip. When I look at all the stoves I have collected over the years I too flash back to fond memories where the Whisperlite was part of.... During those moments I think two thoughts. First, I can't believe that thing STILL works well, and the second thought is... hmmm, maybe I use it on the next adventure!!! Good little stove, but could benefit from being more compact. Boils water in a couple minutes. Can only be run off Naptha. A bit bulky when packed and could be easy cruched in pack. Takes a while to set up, position, pump tank, set up heat sheild and use. Must wait for entire stove to be cool before putting it back in the nylon bag. I owned this stove for five years before selling it. I took the stove on over 10 back country and canoe camping trips. The stove worked great once it was all set up and setup can take up to 10 minutes, which can be annoying after a day of hiking and all you want to do is eat or have a hot drink. It requires a fairly flat piece of ground to set it up on and lined it up with the fuel tank. Just like any naphtha stove the tank must be pressurized and which is done by pumping it by hand. If you are using a large pot everything must be level and you will have to set up your heat shield to decrease boiling time. Cooking is great on it, as it has a wide base and I never had an issue with my pot slipping off. Also, it was very good on fuel and one small tank of naphtha would last me the whole week when I used it to cook two meals a day. My biggest pet peeve was the tear down and storage of the stove. Once it was all packed away it was fairly large and I was always worried that I would crush it in my pack or bend it. The fuel line is not that flexible and I was worried about it getting broken. The most reliable, all weather backpacking stove on the market. Great in cold temperatures where most cannister stoves fail and field maintenance is a breeze. Not multi-fuel (WhisperLite Int'l is multi-fuel). The WhisperLite has been around forever and has seen very few changes, with good reason. No other stove on the market provides such reliable cold weather cooking, and a few shakes after use clears the fuel jet of any build up. The saying that "practice makes perfect" applies to the WhisperLite and I can only assume that negative reviews are based on people who don't take the time to read instructions or practice before taking the stove into the field. With a couple of backyard practice runs, lighting and maintenance in the field are a breeze. A tip for lighting... Don't over-fill the primer cup. Turn the valve off completely after you've filled the primer cup with a small amount of fuel. Overfilling wastes fuel and will make you wait longer than needed to start cooking (hey, every minute counts when you're hungry!). Also, once you've lit the fuel in the primer cup, the instructions say to wait until the flame has almost gone out before turning the fuel valve back on. Instead, I watch carefully until the flame burns out completely and then immediately strike a lighter near the burner. Phoof, I've got a perfect flame without any spitting, flare up, or smoking. Unless I'm through-hiking, I'm all about comfort in the backcountry and will carry substantially more weight than most backpackers would. For you ounce-counters out there, this isn't the lightest stove and you'll need to haul a fuel bottle. Also, unless you are only planning on boiling water (about 4 minutes), you can burn through quite a bit of fuel. A little practice cooking a few trail meals at home (account for elevation and temp in the field) and you'll know exactly what you're in for. Simmering can be a bit tricky but can be achieved with a little practice. You can trying giving the pump about 10 to 12 strokes and then opening the valve as little as possible. I personally find it easier to adjust the distance between the burner and pot with a few well placed rocks. I've used the WhisperLite in temperatures as low as 15 F at altitudes of well over 10,000 feet and never had it fail me. Reliable? So far beyond my expectations that I doubt I'll ever need or buy another stove! I've had my WhisperLite stove for a two years, but I didn't use it very much, maybe four or five times. If you look closely at the pictures here or on other sites, you will see that the part that connects with the fuel bottle is plastic. This plastic part cracked at the end of a long day of hiking. Fuel spilled everywhere and all over my other gear. This plastic component is VERY weak, and I wouldn't recommend this stove to anyone. I had hardly anything to eat. I promised myself I'd write reviews telling people to go with stoves that have more durable parts. There's no point in getting a replacement from MSR, since I wouldn't trust this device again. Make your own choice. The Whisperlite is the same stove as the MSR WhisperLite Internationale, without the option of burning alternative fuels like diesel. It is mechanically identical to the Internationale except for an alternate fuel nozzle and the absence of a wicking cup around the bottom for lighting less-flammable fuels. As a result, it only burns white gas. But I've taken mine around the world and NEVER had a problem finding white gas, so I really don't think the Internationale modification is at all necessary. I've used my WhisperLite as my only camping stove for about fifteen years, and have never once had to do maintenance on it. It comes with a "shakerjet," which is a little pin inside the fuel line that cleans out the nozzle when the stove is shaken. Mine has never clogged. It doesn't light as fast as some other stoves, because you have to let some fuel into the fuel cup, light it, let it burn down to heat the fuel line enough to vaporize the fuel, then relight it. This process takes about two minutes and takes a little practice to know just when to relight it, but is easy to learn and you can't really hurt your stove if you do it wrong. But once lit, the WhisperLite roars like a jet engine. It'll boil a liter of water in like two minutes. It's not as efficient as the new Jetboil stoves, but the fuel is cheaper and easier to come by. The stove comes with two pieces of tin to use as windscreens, one to go around the outside of the stove and one to go around the middle of the stove to keep it from scorching the ground it sits on. You don't really need either one, though they do make it more fuel efficient. The main drawback from a cook's perspective is that these stoves don't simmer very well. They're either on high, or off. If you need to simmer your dinner over low heat, you have to depressurize the fuel bottle a little bit, which isn't hard to do with the pump. The stove uses the standard MSR red pump fuel canisters, which are a brilliant design that I don't expect will ever change. I replaced my original small can with a .75L one because I do a lot of extended mountain trips, cooking for four people for a week or more. 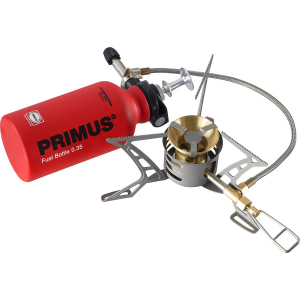 The pump on the fuel canister has never required maintenance, either, despite the prevalence of those little MSR stove repair kits that you see everywhere. With that kit, the WhisperLite can be completely disassembled, cleaned, and reassembled in the field, no other tools required. One primary advantage of liquid fuel stoves is that they always work, even in cold weather when compressed cannister fuels peter out. The WhisperLite Internationale is the stove used by the US Antarctic Research Program in all of their emergency snow survival kits, because you can fire it up even at 40 below, no problems whatsoever, and then run it on the fuel from your crashed airplane or whatever. The stove does have one apparent flaw, which it took me all these years to discover. If you let it rust long enough, as mine did in a flooded basement for a few months, the solid metal part of the fuel line can crack. This is not a piece that can be replaced, since it's central to the stove mechanism, and it can't be easily repaired since it gets red hot when the stove is in use. I know, you shouldn't let your stove rust, I realize that. But if this one part hadn't rusted through, the rest of the stove would still be in perfect working order, though it looks pretty ugly. As a side note, the fuel line and the shakerjet mechanism were still perfectly fine after the flooding incident. I'd recommend this stove to people looking for a lightweight camping stove. I've not used the newer Dragonfly or the Simmerlite, but they supposedly solve the problem of not being able to simmer, which has never bothered me much. They also cost more, and are more complicated. 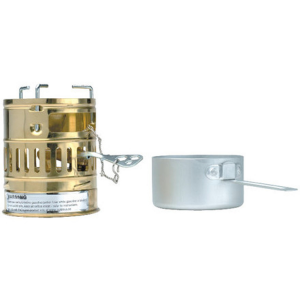 The WhisperLite is the classic, most simple, brilliantly designed camp stove. It works well, you'll never have it break on you, and you can rest easy knowing that the backpacking community has lived and died by it for years. Solid stove! Keep it clean and maintained and it will keep you cooking forever! I’ve got this one in my emergency grab and go. Welcome to Tralspace, Ron. How long have you had your WhisperLite? If you have some pictures of yours in action, those would be great to see in your review too. Thanks! If you can work an old Coleman lantern you should be able to figure out this stove. It can be a little fickle to get lit if it's really windy. The flame adjusts well, but a little bit of a delayed reaction due to the fuel type. I think this does a great job for a micro stove, but you should have seen my wife's (then girlfriend, on first outing) eyes when I pulled this thing out to make s'mores, lol. Haven't timed how long it takes to boil something but just cooking for myself or one other it works fairly quick. The stove does stay lit very well, but getting it lit on a windy day ca be a challenge. Haven't run out of fuel cooking a meal yet as long as I started with a full tank, usually get at least three meals out of a tank. I did buy one of those little stability bases for this as I tend to go to rocky areas but don't need it very often. This tiny little thing fits in my REI cookset very well. I've had this stove for about thirteen years and although I don't get to use it as often as I would like it always works when I need it. It's not the perfect stove, but it is great for me and I love it. I think anyone would do great buying this stove. I've used one of these in the Boundary Waters. Definitely a good stove. Thanks for posting. Price Paid: Can't remember, too long ago. I bought my first Whisperlite about 25 years ago. It does what I need it to do for long trips with several people at high altitude and in cold weather. A couple of years ago, the plastic pump housing broke while I was testing it for a multi-day trip in the Beartooths. I mailed it to MSR and they sent me a new pump no questions asked, and I received it on time for the trip. Now that's customer service! Bullet proof stove, very field repairable, worked at 6000ft on Mt Rainier in 20 deg without a hiccup, boils water in 3.5 min. Love this stove, has not failed me even when a group of scouts spilled a pan full of eggs into the burner. The only way I have found to summer is to put a pan half on the burner on low and the other side of the pan on a rock or something solid. Love the ability to shake the stove to clean the jets. The size of this stove is awesome and what it can do is even better. I do a lot of interior camping with portaging so this stove has been dependable, reliable and it uses minimal fuel, which means I don't have to cart canisters of fuel in and worry whether I have enough fuel for my trips. It is compact that I tuck it away into a secure container and don't worry about it as travel! It's a great product! Not the easiest stove to use. You need to pre-heat for the better part of a minute and if you do it wrong the stove needs to cool down again before you try to light it. Quite finicky. Also seems to get clogged often. The cleaning and trouble shooting guide is good but when you are cold and hungry the last thing you want to do is take apart a stove and get fuel all over your hands for twenty minutes. I have used the stove twice on multi-day remote Vancouver Island winter camping trips. My buddy brought it and we didn't bring a backup as he had never before had problems with it. But after a long drive, hike and setting up camp we were ready to eat and the stove didn't light. A weak, sputtering flame that kept going out was all we got. Fortunately we got a nice little fire going and cooked a stew. The next day my friend spent half an hour going over the instruction booklet, dismantling and cleaning the stove. It worked great for the rest of the trip. However, I borrowed the stove for another trip and it did the same thing after a few days. Maybe we got something in the fuel tank but it just seems like too much trouble for what it's worth. This stove is light and fairly easy to set up and use. 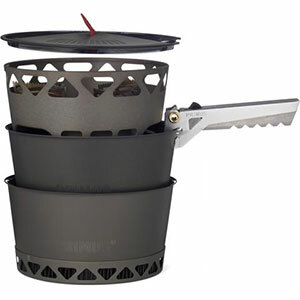 The Whisperlite is another one of the many backpack stoves on the market. I think it is a good stove, not the hottest/highest temperature in this day and age, however still a good stove. There are several small parts to keep track of with this stove and you will want to carry a small repair kit with spare parts. You will find that with stoves as many other backpack items there are devout followers and to even mention another brand/style is blasphemy. So try to borrow or rent several types and brands to find the one that is your best fit. You will find that this type of fuel stove is highly packable, burns hotter than most other types, and will heat more liters of water per liter of fuel than most other types of fuel used for cooking. I have a collection over 20 backpack stoves including the Whisperlite. My first stove was a well used WWII surplus pack stove, it is dated 1945 and is still in good working condition. The Whisperlite I have is from the early 80's and it too still works like new. I mention this to say, try several and pick a good one. It will last a lifetime with proper care and maintenance. If the high prices of new stoves are out of reach, you can find a quality used one at an affordable price If it has been taken care of it will serve as good as a new one. One word of caution. Beware of stoves that can only be used with that manufacturer's type of fuel canister. If it is discontinued you will not be able to get fuel for it and it will become useless. If you decide on a canister stove get one that will fit the standard canister tap or that has adapters so it can be attached to standard thread canisters. Dependable Easy to set up, easy to prime and light. Easy to set up, easy to prime and light. Flame control is good, cooks well at all heat. Packs small. Never really used in real windy conditions but in light wind the wind block works well. Have had since 1998 and even I haven't broken yet. I am rough on gear. 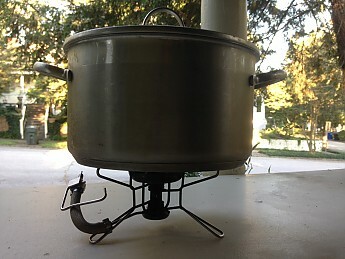 I have three MSR ultra-light stoves from current to dating back over 25 years. They all work flawlessly and powerfully like the first day I bought them. The simple weight-saving design is genius. It's nice to have something that you can depend on in any weather or circumstance. 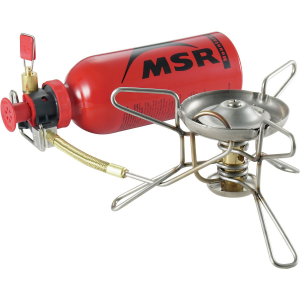 When you first see an MSR lightweight stove, you'll be confused at how it folds up so compactly. But once you click all the legs into place and attach the fuel bottle that contributes to the stove's stability, you'll be impressed by the genius by which it has been designed. If you backpack or adventure, saving weight is paramount. I know of no other stove that comes close. And the power of the flame and its efficiency is legendary among mountaineers and serious backpackers. I have never had a problem with mine. 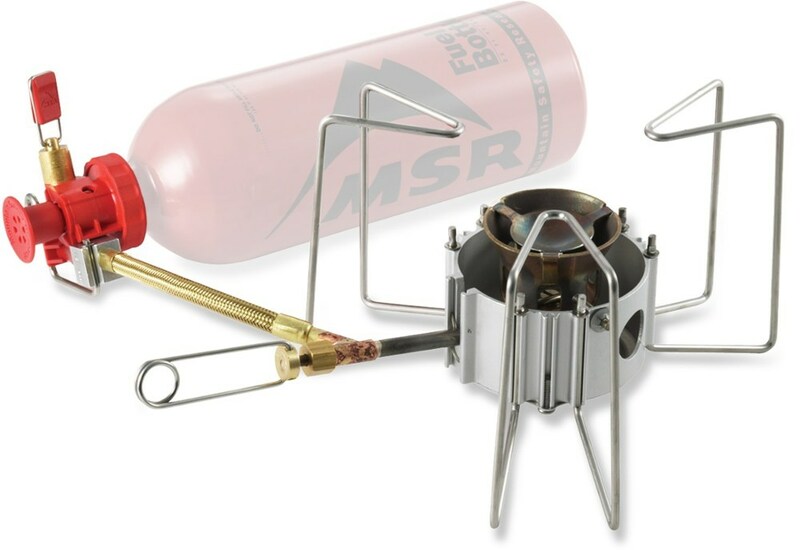 I still have and use the first MSR stove design on the market, along with two newer MSR's. They all work dependably and flawlessly. You can't say that about anything these days it seems, except for an MSR stove. I would definitely recommend this reliable, durable stove that boils water quickly and uses fuel fairly efficiently. Long-lasting and easy to use, but look elsewhere for fine temperature control. I purchased a new MSR Whisperlite a number of years ago, and I've been very happy with its performance. It's slightly more complicated to set up and prime than the simpler propane stoves, but the instruction manual is thorough and clear. Once you get the hang of it it's simple and easy to set up, prime, and ignite. This stove is built to boil; if you're looking to do a lot of cooking that involves simmering, you may want to look elsewhere (or get a riser bar for your pots). With that said, it boils quickly, it's efficient with fuel, and it's great when you're making food for larger groups. The 3-legged design also helps with stability. I've had this stove for a number of years now and it's been extremely reliable in adverse conditions. Rain, snow, wind — it's always good to go. It packs away neatly and is decently lightweight. I've taken this stove on casual weekend canoe trips and multi-week backpacking trips, and it's never let me down. Just received the stove for Xmas and took it out on an 18-degree day last campout to boil water for tea and cocoa. Very easy set up, logical, lights right up and did the job. Love the aluminum base and windshield too. We used it all day to keep hot water going for drinks and not at all an issue. Can't wait to try it out on a solo trip for retort or even cook a main dish or two. To me, it's a no brainer. Like all of the posters below, when something just seems to be a good thing... don't change it. I have been involved with an outdoor non-profit summer camp in the Trinity Alps for 15 years and this has always been the go-to stove. True there have been the occasional issues with needing to take it apart to maintain, but generally as long as you clean it once every 10 years you are OK. Yes, you sometimes do need to replace parts, but that happens to almost every man-made product out there. What impresses me the most about this stove is the ease in which you use it. Given that any particular stove will be passed between several groups of counselors and kids, these things take a beating. However, with one in-service, you can train a group of happy-go-lucky 18-21 year olds how to use it like a pro that have never handled a stove before. We have gone through several of these over the years and while we are not name brand junkies or elite gear snobs, this particular stove is the only thing that we will use with our group of kids. Buy it, use it, love it! used stove for several years without any complaints until a couple of weeks ago. first time used in colder than -25 (below) weather and had problems with getting enough fuel to keep the stove running. very cold with a moose down i needed to melt snow to hydrate and was quite a fight keeping it lit. best stove i have ever had. I do a lot of camping with the scouts and there is always a Whisperlite in the stove line up by some Dad that wants to cook. My experience is that this stove is troublesome and a pain to keep clean and operate. I am constantly cooking for others as a result of their w=Whisperlite breaking. If you have an interest in buying a stove, buy a svea 123 or a brunton optimus nova and you will never regret it. Price Paid: my dad's for 20-some years. Yo, to the dude who was using petrol, this is a white gas stove. Of course it's gonna clog up with anything else!!! Just be glad you still have your eyebrows. OK, my dad got this stove out to show me a little while back. After we replaced the 20-odd year old gasket, the stove lit right up, no problem. 1st time in years it had even been handled. In conclusion, it lives up to 5 stars. Great little stove. Excellent for camp cooking, very light weight, easy to use. Perfect for cooking small portions and simmering. Love it! Perfect backpacking or lightweight camping stove. quite possibly the worst stove i have in my vast collection. Just hope that the price comes down a bit from £125.00 GBP. This is the second MSR stove I have owned; I purchased it to replace my old MSR-XGK which at over 25 years old is showing its age. Overall I can find no fault with this stove. It lights easily and burns hot yet is fuel efficient for longer trips. Field maintenance is easy. I have often taken this stove on extended trips for over 6 months using it every day to cook meals in the winter and like the XGK has never let me down. I highly recommend this item. In my opinion it's one of the truly fine items on the market today. Great stove for any outdoors person. A must have. Great stove for any outdoors person. A must have. Not good for simmering food though. Better used for just boiling! I've only used this stove once in the backcountry but it was enough to know something about it. The stove works great in that it boils water very fast. I had water boiling and in our "hot water needed" meals in no time. Rock-solid performance over the past 12+ years. After all these years, it ain't the prettiest thing, but it works well and passes the "Huebs test" for durability. This may not mean much to you... but all that know me will state this is no small accomplishment! It cooks well, though lengthy simmering requires constant attention to avoid scorching or flame-out. Fuel efficiency appears excellent, with an 11 oz. bottle good fer most weekend trips. In addition to countless "small" trips, I've used it on four, week-long excursions with a group of four. Two of these at elev. 9,000 to 10,000 feet. Used between 23 and 33 oz. of fuel (1, 22 oz. and 1, 11 oz. bottle) on each trip to cook fer 4 hungry hikers (several gallons boiled). This is my old stand-by for nearly 10 years. Not a problem with it. Lights up first time every time no matter what the weather. Quiet too. Only drawback is it doesn't simmer really well, but the newer pump/valve control gets pretty close! One of the best white gas stoves, if not the best, on the current market. Have used this stove since it first came out and the only part I have ever replaced is the o-ring on the fuel bottle. Many years and many miles this stove has gone. The only other stoves I use are the MSR GK, for mountaineering trips, and the MSR PocketRocket, for solos and light trips. May sound like a MSR fanboy but in 35 years of outdoor adventures these stoves have proven to be the best. Used more then four years. Very reliable. Only con is no fire output adjustment. Very reliable, I have had no problems with this stove ever. It's a must-have. It beats the paints off of JetBoil which I also use. I purchased my Whisperlite used. After several high altitude backpacking trips I've found this stove to be one of my best backpacking investments. Wind had little effect at getting the stove lit and running. This lightweight stove gets the job done! I've used this stove for about 20 years for backpacking and campsite camping. I use it only a few times a year and had it put away without using it for seven years (see below). MSR might have changed the stove slightly in all that time, but my stove looks exactly like the current photos. The only other backpacking stove I've used was a Coleman Peak 1 -- also a white gas stove. The WhisperLite is very light and compact. I carry it in a 2 quart pot. Since it folds, it is able to have a wide stance and good span to support larger pots and pans and is extremely stable. The windscreen and reflector are flexible pieces of aluminum that you just fold up when not in use. Mine have many creases, but work fine and you can buy replacements of just those pieces. The folding aspect also causes the only real disadvantage I can think of: Since you have to fold it up to put it away, your hands can get dirty when cleaning off the soot that comes from the flames that occur during priming. I just use some TP to wipe it off carefully before putting it away. The detachable fuel bottle gives you the ability to use just the right sized bottle for your trip. I use a 1-liter Sig bottle and just vary the amount of white gas I carry since I don't worry about a couple extra ounces if it's a short trip. I think I only used about 2/3 of the liter on a 7-day trip for two people. In contrast, for the Peak 1, you'd have to carry an extra bottle in addition to the built-in tank for a long trip, which is almost certainly heavier and requires pouring fuel from the spare bottle into the tank. The WhisperLite boils a liter of water in less than the four minutes it claimed to. It is tricky to get a decent simmer, but with careful adjustment we can cook pancakes without burning them. My stove got clogged up only once, but that was after a 7-year gap in use (because I waited for my younger child to be out of diapers to return to camping). I bought the maintenance kit, but found that I only needed to poke the little wire jet cleaner into the jet hole to get the stove to work again (I could have done that without the kit) Even the original pump seal still works after 20 years, so I have a spare from the kit. The stove has worked fine for me in below-freezing temperatures during mornings in the high Sierras where puddles would be frozen over when we woke up. Just to be safe, I kept the fuel bottle warm overnight by putting it in the foot of my sleeping bag (I'm short and use a full-sized bag since I also like to keep my clothes for the next day warm that way). But for all I know, it probably isn't necessary. I just didn't want to risk facing a chilly morning without a hot drink.